The ocular kinematic data collected in Felis and Otolemur demonstrate that both the anterior temporalis and medial pterygoid muscles can cause displacements of the eye during muscle contraction. Stimulation of the anterior temporalis caused mediolateral movements in both taxa, although the directions were opposite in Otolemur and Felis. Identifying a basis for the difference in direction between taxa is not possible from the data at hand. Probable causes include differences in the position or size of the anterior temporalis and eye size and position between these taxa. Orbit orientation is not a factor because orbit convergence is not significantly different between Otolemur and small-bodied felids (Heesy, 2003). Also of interest is the protrusion generated by both anterior temporalis and medial pterygoid stimulation in Felis, and medial pterygoid stimulation in Otolemur (we do not have video data to evaluate protrusion during anterior temporalis stimulation in Otolemur). Protruding movements of the eye could also lead to disparity and blur. In several of the simultaneous stimulations of the anterior temporalis and medial pterygoid in Otolemur, the resulting movements approached but did not exceed the diplopia threshold. However it is important to note that both eyes would be affected during mastication, and the movements of the eyes and visual axes would be additive (really doubled). This would pull the visual axes out of fixation, leading to diplopia. The mean magnitudes of the movements generated in cat subjects 1 and 3 exceed those found in the Otolemur and cat subject 2 by an order of magnitude. We view the data collected for the second cat subject with some caution because we had difficulty stimulating either muscle during the experiment. In all cases for subject 2, the contractions were weak, and this is probably related to the difference in magnitudes found. Reasons for the order of magnitude difference between the Otolemur and the other two cat subjects could be related to, as above, differences between these taxa in the position or size of the anterior temporalis and eye size, and position or differences in degree of contraction due to electrode position. One reason, the functional difference between large postorbital processes and bars, can be addressed. Cat subjects 1 and 3 varied in lateral orbital wall morphology: subject 1 had a postorbital ligament whereas 3 had a complete bar. Yet the movements generated are not demonstrably different in orientation or magnitude between subjects 1 and 3 (Table 2). For this reason, it is unlikely that large postorbital processes are different from bars in insulating the eye and orbit from masticatory muscles. In addition, the fact that movements were generated in two animals with bars, Otolemur and one Felis, weakens the argument that the presence of bars alone prevents potentially disruptive eye movements. The ocular kinematic data are relevant to explaining the function of postorbital bars in primates as well as bars and postorbital processes in other mammals. These data show that the contraction of masticatory muscles has the potential to disruptively move the eye in subjects with complete postorbital bars. Therefore, the presence of postorbital bars is not sufficient to maintain normal oculomotor function during mastication unless the movements caused by masticatory muscle contractions are corrected for by extraocular muscle activity in the awake animal. As reviewed in the earlier section entitled Neurological and Morphological Maintenance of Eye Position, the lateral orbit is the site of attachment of orbital septa and the lateral rectus pulleys. Stability of the lateral orbit is crucial because the orbital head and pulley of the lateral rectus, and possibly the superior rectus muscle as well as these orbital septa maintain eye position. Without this stability the corrective linear movements provided by the orbital head and pulley of the lateral rectus would fail. Additionally, normal oculomotor function would fail because the corollary discharge system would no longer have reliable eye and extraocular muscle position upon which to coordinate subsequent movements. As a stiff bony structure, the postorbital bar prevents substantial deformation of the lateral orbit during mastication in galagonids and presumably other mammals as well (Ravosa et al., 2000a,b), and serves the function that Cartmill first suggested, preventing orbit deformation. Nevertheless, it is reasonable to question the relevance of a stiff lateral orbit if the anterior temporalis and medial pterygoid muscles can directly displace the eye during muscle contraction. Based on our review of the literature as presented in the introduction, we believe that several possible neural reflexes or mechanisms exist to correct displacements due to masticatory muscle contraction, all of which rely on stable orbit position. Retinocortical mechanisms have been studied in humans that correct for eye displacement or induced visual jitter (Ilg et al., 1989; Murakami and Cavanagh, 1998, 2001; see also Bridgeman and Delgado, 1984; Stark and Bridgeman, 1983). These corrective movements function to maintain the point of fixation and binocular image fusion by compensatory eye rotation (Ilg et al., 1989; see also Rine and Skavenski, 1997). These displacements can be as great as one degree (Ilg et al., 1989), which is substantially larger than disparity sensitivity based on passive retinal correspondence (Table 1). However, in humans these mechanisms seem to operate optimally for low frequency eye displacements (<1 Hz) and fail for higher frequency (>1-1.5 Hz) and magnitude (-1°) eye movements (Ilg et al., 1989; Rashbass and Westheimer, 1961; Velay et al., 1997). Chewing frequency and associated masticatory muscle firing in many mammals exceeds this frequency (Druzinsky, 1993), and for this reason the corrective mechanism found in humans might be expected to fail in other mammals. Early primates were probably very small-bodied (Gebo, 2000; Ross, 2000). As small mammals chew at high frequencies (Druzinsky, 1993), oculomotor failure may have occurred. On the other hand, humans, like other anthropoids, have higher visual acuity than any other mammals tested (Ross, 2000), and may therefore have much less tolerance for moderate to high frequency and magnitude eye displacements. Other taxa, including strepsirrhines, may have greater tolerance than do anthropoids (Table 1). The data at hand do not serve to resolve this issue. We consider compensation to be the likely explanation for maintenance of oculomotor stability. The function of the postorbital bar is to maintain a stiff lateral orbit to prevent gross deformation of the orbital margin. This achieves two things. First, as suggested by Cartmill (1970, 1972) it ameliorates gross eye movements caused by deformation of the orbit. Second, it provides a stable substrate from which the extraocular muscle system can compensate for the remaining small scale eye movements identified by the present study as being caused by contraction of the anterior temporalis and medial pterygoid. 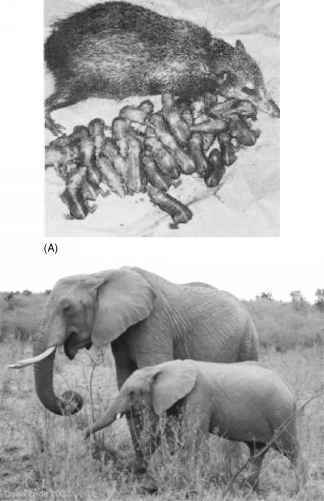 Another alternative, which we consider to be much less probable, is that eye displacements and visual disruption occur during mastication in nonanthropoid mammals. It is important to consider the possibility that our method for stimulating the anterior temporalis and medial pterygoid does not adequately simulate normal muscle contraction during mastication. For example, our method may stimulate more motor units than are normally contracting at any one time during chewing. This in turn may cause eye displacements that exceed those found in awake masticating animals. This possibility suggests that disruptive eye movements are dependent on degree of contraction, with low to moderate masticatory contractions not disrupting vision whereas powerful mastication may. One way, therefore, for an animal to prevent oscillopsia is simply not to masticate powerfully. Whereas our data do establish that these two muscles can potentially displace the eye, further data are required to establish the degree to which they do during mastication. Ideally, in order to address this question one would require simultaneous masticatory muscle EMG and eye movement data collected in conjunction with data that distinguish voluntary and involuntary eye movement commands from ancillary eye movements. Finally, it is interesting to mention that certain neural compensatory mechanisms may be limited to primates. Using fMRI, Sasaki and colleagues (2002) found that area MT+ (in the visual cortex) was active in compensating for visual jitter. If MT+ is involved in compensating for jitter, such as that generated by bone transduction of masticatory forces (Murakami and Cavanagh, 1998, 2001), then the possibility exists that primates might be better at correcting for jitter than other taxa because they have a specialized or unique area MT (Allman and Kaas, 1971; Allman et al., 1973; Kaas, 1978; Kaas and Preuss, 1993). This cortical area, which is known to be responsible for the analysis of movement in visual images (e.g., Allman, 1999), has not been unequivocally identified in any group other than primates (Allman and Kaas, 1971; Allman et al., 1973; Kaas, 1978; Kaas and Preuss, 1993). An equivalent zone has been suggested to be present in tree shrews and megachi-ropterans, but without the morphology, input, and mapping of the contralateral visual field characteristic of the primate area MT (Kaas and Preuss, 1993; Sesma et al., 1984). If area MT in primates compensates for jitter as the human area MT+ (Sasaki et al., 2002), then such improved oculomotor stability may be unique to primates. The haplorhine postorbital septum is a bony wall that has been hypothesized to insulate the eye and orbital contents from impingement by the anterior temporalis muscle and fascia (Cartmill, 1980; Ross, 1995a,b, 1996). In haplorhines, the anterior temporalis partly curves around the septum unlike in strepsirrhines and other taxa without septa, where this muscle is merely laterally adjacent to the orbital contents. (Cartmill, 1980, 1994; Ross, 1995b). In general, our ocular kinematic results are consistent with the suggestion that the anterior temporalis muscle could impinge on the eye if the septum were not in place to prevent this. In taxa with postorbital processes or bars, masticatory muscle contraction is capable of generating disruptive movements of the eye, which a septum could potentially alleviate. This may not be true of Tarsius, however, because the orbital head of the medial pterygoid originates from the orbital wall and travels through the inferior orbital fissure out of the orbit (Cartmill, 1978, 1980; Fiedler, 1953; Ross, 1995b). The site of origin of this muscle is roughly equivalent in galagonids, although not as rostral or dorsal as in Tarsius (C.F. Ross, personal observation), and it is possible that protruding movement would be generated in Tarsius during medial pterygoid stimulation as was found for Otolemur garnettii in this study. The medial pterygoid stimulation results in Otolemur are certainly consistent with Cartmill's suggestion that medial pterygoid contractions are transmitted to the orbital contents in Tarsius (Cartmill, 1980). It has been alternatively suggested that the dense taut periorbita in Tarsius may be sufficient to prevent vibrations due to medial pterygoid contraction (Ross, 1995b).